Statistics education is all about teaching people to fish. In a topic on questionnaire design, we choose as our application the consumption of sugar drinks, the latest health evil. We get the students to design questionnaires to find out drinking habits. Clearly we don’t want to focus too much on the sugar drink aspect, as this is the context rather than the point of the learning. What we do want to focus on is the process, so that in future, students can transfer their experience writing a questionnaire about sugar drinks to designing a questionnaire about another topic, such as chocolate, or shoe-buying habits. Questionnaire design is part of the New Zealand school curriculum, and the process includes a desk-check and a pilot survey. When the students are assessed, they must show the process they have gone through in order to produce the final questionnaire. The process is at least as important as the resulting questionnaire itself. Here is our latest video, teaching the process of questionnaire design. Another important learning tool is the use of examples. When I am writing computer code, I usually search on the web or in the manual for a similar piece of code, and work out how it works and adapt it. When I am trying to make a graphic of something, I look around at other graphics, and see what works for me and what does not. I use what I have learned in developing my own graphics. Similarly when we are teaching questionnaire design, we should have examples of good questionnaires, and not so good questionnaires, so that students can see what they are aiming for. This is especially true for statistical report-writing, where a good example can be very helpful for students to see what is required. But I’d like to take it a step further. Perhaps as well as teaching how to design a questionnaire, or write a report, we should be teaching how to learn how to design a questionnaire. This is a transferable skill to many areas of statistics and probability as well as operations research, mathematics, life… This is teaching people to be “life-long learners”, a popular catchphrase. We could start the topic by asking, “How would you learn how to design a questionnaire?” then see what the students come up with. If I were trying to learn how to design a questionnaire, I would look at what the process might entail. I would think about the whole statistical process, thinking about similarities and differences. I would think about things that could go wrong in a questionnaire. I would also spend some time on the web, and particularly YouTube, looking at lessons on how to design a questionnaire. I would ask questions. I would look at good questionnaires. I would then try out my process, perhaps on a smaller problem. I would evaluate my process by looking at the end-result. I would think about what worked and what didn’t, and what I would do next time. This gives us three layers of learning, Our students are learning how to write a questionnaire about sugar drinks, and the output from that is a questionnaire. They are also learning the general process of designing a questionnaire, that can be transferred to other questionnaire contexts. Then at the next level up, they are learning how to learn a process, in this case the process of designing a questionnaire. This skill can be transferred to learning other skills or processes, such as writing a time series report, or setting up an experiment or critiquing a statistical report. I suspect that the top layer of learning how to learn is often neglected, but is a necessary skill for success at higher learning. We are keen as teachers to make sure that students have all the materials and experiences they need in order to learn processes and concepts. Maybe we need to think a bit more about giving students more opportunities to be consciously learning how to learn new processes and concepts. We can liken it a little to learning history. When a class studies a certain period in history, there are important concepts and processes that they are also learning, as well as the specifics of that topic. In reality the topic is pretty much arbitrary, as it is the tool by which the students learn history skills, such as critical thinking, comparing, drawing parallels and summarising. In statistics the context, though hopefully interesting, is seldom important in itself. What matters is the concepts, skills and attitudes the student develops through the analysis. The higher level in history might be to learn how to learn about a new philosophical approach, whereas the higher level in statistics is learning how to learn a process. 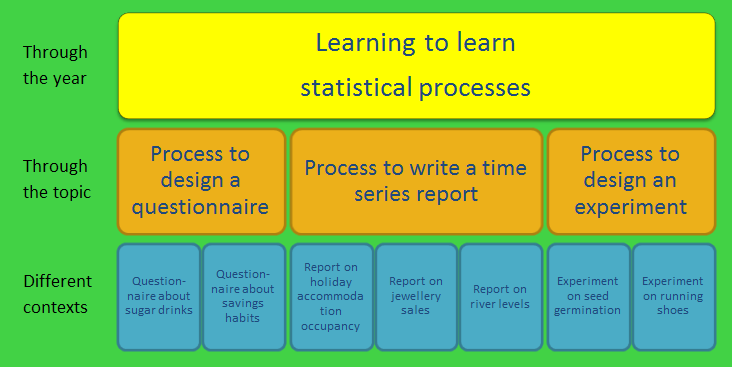 The materials we provide at Statistics Learning Centre are mainly fishing lessons, with some examples of good and bad fish. It would be great if we could also use them to develop students’ ability to learn new things, as well as to do statistics. Something to work towards! Years ago, I was with a group of academics meeting MPs in London. My own MP asked, “Why can’t all degree courses be reduced to two years?” The answer – that I did not have the wit to come up with at the time – is that we can “teach” material in any time scale but can’t assume that students can absorb the material, reflect on it, and infer useful “learning”. You make a useful point about learning to learn, but that is internal and cannot be imposed, certainly not by a one size (and one timescale) fits all. The biggest problem with questionnaire design is recognising that the more the designers think about the topic, the harder they find it to see the questionnaire from the point of view of someone who has never seen it before and may not have consciously thought about the topic. Maybe a starting point is to give students a questionnaire to complete and then discuss why it was difficult to answer “How good was the experience on scale 1 to 10?”, and what would motivate them to reply at all and not make silly replies to be perverse (like I do).